With the marine industry severely impacted by hurricanes over the last few years, there have been many lessons learned. As a result, a great deal of emphasis has been placed on disaster planning and preparedness within the recreational marine industry. However, the wild fires in California recently demonstrated that disaster planning and preparedness should not be limited to only coastal marinas. Every facility should have a disaster plan related to the greatest risk the facility faces. 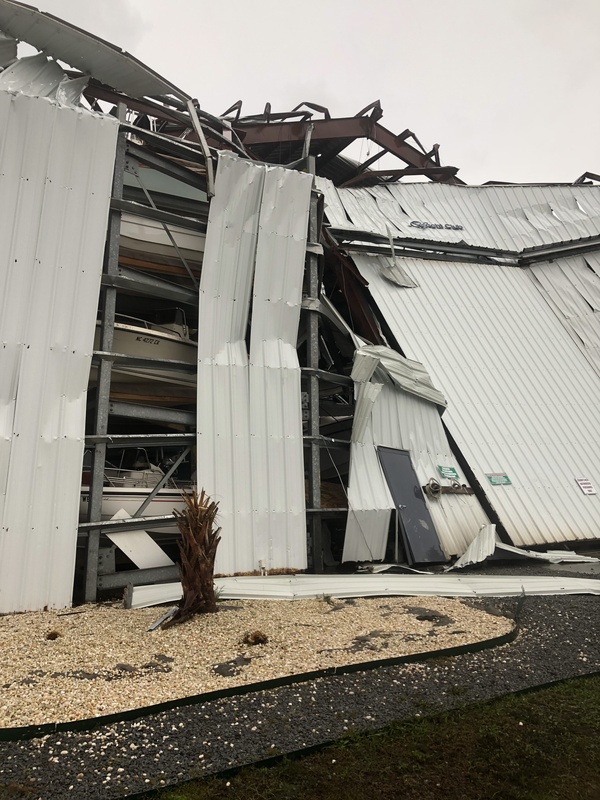 After a significant weather event, disaster or catastrophe, marina business owners and managers should have a detailed plan to ensure operations resume in a safe and orderly fashion. In addition, depending on the level of the event, it would be important to recognize the potential increased risk of hazards and regulatory oversight. A proper plan will minimize employee exposure to hazards and reduce the risks of regulatory non-compliance. In most circumstances, disaster recovery efforts may require employees to conquer unfamiliar tasks by unusual means. Heavy equipment may be needed to lift boats or remove debris. Additionally, staff may be called upon to assist in areas where the employee may have little training or expertise. After Hurricane Irma, a video went viral of a nun operating a chain saw. When looking at the video, it did not take long to determine that the nun was not familiar with operating the saw and was actually putting herself in danger. Business owners and managers should recognize the increase risk that potential hazards exist, are unfamiliar, and ensure employees are properly protected from injury. The one constant with disaster is it seems that no two events are alike. Take Hurricane Florence and Hurricane Michael as examples. Florence was a major hurricane two days prior to landfall. Florence weakened rather rapidly, stalled as it came ashore, and left behind unprecedented flooding. Michael, on the other hand, was just a tropical storm two days before landfall. With rapid intensification and forward speed, Michael came ashore as a very strong Category IV storm and left a trail of destruction from Florida to Virginia. When returning to work, employers and employees should expect the unexpected. Storm damage may create exposures to harmful chemicals, raw sewage or damaged electrical systems. Very often after a catastrophic event, wildlife are often displaced. In fact, after Hurricanes Matthew and Irma, Florida saw a drastic rise in the number of snake bites. The snakes were displaced during the storm and often encountered during cleanup. In most cases, after a disaster or catastrophic event, there is a desire to return to normal operations as quickly as possible. In many cases, recovery operations may begin before the power is restored. The disaster plan should include the proper provisions with regard to food, water and shelter for employees returning to a disaster area. Proper personal protective equipment (PPE), such as proper gloves and footwear, are also important. Cleanup and recovery operations require a systematic and patient approach. Complacency leads to injuries. Shortcuts can lead to a very serious accident and emergency response may be limited or delayed. Take the time to assess the situation, don the proper PPE, and work through potential hazards safely. After Hurricane Harvey impacted Texas, the federal Occupational Safety and Health Administration (OSHA) responded by sending in rapid response teams. The teams were brought in from other regions of the country. Initially, federal OSHA placed a strong emphasis on employer education. As the recovery began and worker injuries increased, that emphasis changed to enforcement. As stated earlier, recognizing hazards and minimizing risks can be very helpful in recovery. However, should an accident occur, it is important to know what the state or federal laws require when it comes to self-reporting employee injuries. At the federal level, a workplace fatality must be reported within eight hours. An employee requiring overnight hospitalization, suffering an amputation, or loss of eye should be reported within 24 hours. Most states follow the same guidelines, but there are some exceptions. Be sure to review the requirements of the state where the business is located. A safety plan should be in place prior to the disaster. Employee training should be up to date. Documents such as the Safety Data Sheets (SDS) and OSHA 300 series injury logs should be current. As business operations return to normal, evaluate the disaster plan and identify areas that may need improvement. Like a vessel, a good safety program requires regular maintenance and upkeep. Many storm related fatalities occur weeks after the storm. Weeks after Florence, a New Bern, North Carolina, man died from an infection caused by a cut during cleanup. After Irma, several lives were lost from heat related injuries at a nursing home due to power loss. Employers should be mindful of the toll these events take on the workers, their families and communities. Tempers may flare. Emotions will run high. Strong leadership is required to effectively manage through crisis. Robert Smith is executive director of Fisher Phillips Safety Solutions. He can be reached at rsmith@FPSafetySolutions.com or 404/240-4147.